Some times ago I stumbled on a post at Offensive Computing where an user had some problems trying to figure out the encryption used by a malware (md5=36401cb9178232dde01b2788e8fc56f4). If you know which are the first common bytes in an exe file you should be able to figure out yourself which kind of encryption has been used. The presence of many 0x13 bytes is a nice hint, the file has been rot13h-ed. Just to make things clear, I used the word rot13h which is different from the well known rot13 encryption. In an old blog entry I talked about a little ida plugin able to extract and analyze an hidden file; I slightly changed the plugin adding the possibility to un-rot13h the hidden file. Roaming around Symantec web pages I stumbled on a review of a trojan named Ascesso. The malware does a lot of things that are described inside the “Technical details” section. I decided to give it a try just because it’s interesting to read what a malware does, but it’s much more funny when you play with it! In this blog entry I won’t talk about what the malware does, but I’ll write something about the way I used to obtain a readable dead list inside Ida. One of the next blog entry could be focused on the analysis of the malware, don’t know. The file I’m going to analyze is named asc3550.sys, md5=BBEB49A32417226CABED3E104A9C94B5. 00400246 mov edx, [edx] ; edx is an address !?! 00400248 mov edx, [edx+0Ch] ; edx points to a structure !?! How to know the exact value pointed by [esp+8]? Taking in mind that the file I’m analyzing is a .sys file you can get the value inside the stack with a simple deducting reasoning. I inserted the Message function just because I wanted to see the first non-decrypted address: 0x409A9C; you can remove the function, if you prefer. Ok, now that the decryption is complete I have to look at the decrypted code. The last instruction of the initial decryption routine will bring me directly at a fresh decrypted instruction, which is the next instruction to be executed? The decrypted code is a small routine, all the other bytes of the file are still crypted; maybe I have to deal with some more layers. 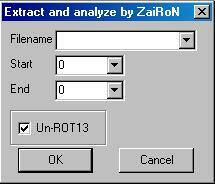 The decrypted code contains an initializations part, some calls end a final jmp instruction. It’s pretty easy to understand the initialization code. I won’t attach any snippet,it’s only a sequence of mov/add/lea instructions used to retrieve/store some special values that are used later. Do you know what 400240 is? It’s the entry point of the file. It’s something to remember for the next decryption script. Just wait some minutes and I’ll tell you everything about these parameters. Another simple decryption. This time a xor instruction between the crypted dword and a fixed value, it’s 0x003CF5B5 and it’s located at address 409A38. Look at the comments I inserted in the code, don’t you have any doubt about it? The decryption routine resides in .reloc section, is it possible to decrypt all the bytes in .reloc section? Well, no because if you decrypt every single byte you’ll decrypt the decryption routine generating a bsod. That’s why the call needs the first two parameters (0x9540 and 0x8FA0). The values are taken from .reloc IMAGE_SECTION_HEADER. One of them, 0x8FA0, is the Raw Offset of of the section. To calculate the number of bytes to decrypt the malware uses 0x9540 substracting 0x8FA0 from it, obtaining 0x5A0. These are the bytes to decrypt. The rest of the bytes belong to the decryption routine I’m checking and they are untouchables. 1. it checks for ‘rsrc’. This is a common name generally used for resource type section, if the file contains this particular section the decryption won’t be executed over that section. The driver doesn’t have a .rsrc section for sure, why the author needs to add this check? 2. do you remember the 5 parameters passed to the function? One of them is the value 1. At 40995A it checks that value. The condition is satisfied and the conditional jump occours. This function is called one time only, which is the purpose of this check? 3. it really needs two parameters (0x9540, 0x8FA0) and a sub instruction? It only needs 0x5A0 and a different implementation algorithm. Call_4099A7 is almost identical to Call Decrypt_current_section, they only differ by a pushad, nothing more. Hm, who adds an useless bugged function in his code? I might be wrong but ‘rip’ is the first thing I can think of, what do you think? // remember the last piece of code in the initialization? This diagram should be enough for you to understand the algo. Taking in mind I’m going to reconstruct a fully readable file under IDA, is it necessary to change the relocated addresses? The answer is no; as you can see from the picture above relocation is not applied when DriverStart is equal to ImageBase, I’ll do the same. After relocation there’s a little function, it changes some fields in the PE header. Some minor changes to PE header. It changes rva and size relative to IMAGE_DIRECTORY_ENTRY_EXPORT and IMAGE_DIRECTORY_ENTRY_BASERELOC. The last part of the loader, the function starts at 4096B7. The algorithm fixes every single FirstThunk element overwriting the old value with the starting memory address of the relative function. The external loop scans every single IMAGE_IMPORT_DESCRIPTOR structure, and the internal function changes every single FirstThunk. At this point the malware uses MmGetSystemRoutineAddress to retrieve the function’s address, that’s why MmGetSystemRoutineAddress is one of the functions imported by the original encrypted file. Once it has the address of the function it stores the memory address at 4045C0. There’s a little exception in this system regarding the function from ndis module, the malware doesn’t use MmGet.. function but it takes the addresses directly from the running module. Why? I’m sure you can easily find out why by yourself. // Do I need to fix this dword? That’s all, now you can explore the malware.